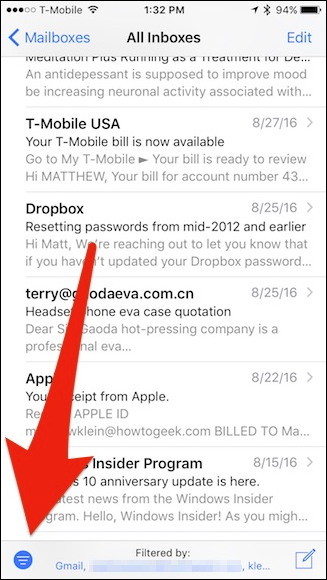 iOS 10 finally adds the ability to filter your email based on a number of preset criteria. The pickings are slim right now, but it’s a promising start. Mail filters may not be anything new to you. If you use Mail on macOS (or other popular email programs for that matter), then you’re already familiar with rules, but you can also easily sort your mailboxes a number of ways. 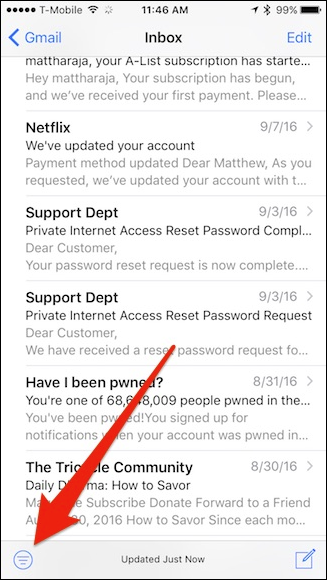 On the mobile Mail app, filters have been absent, until now. 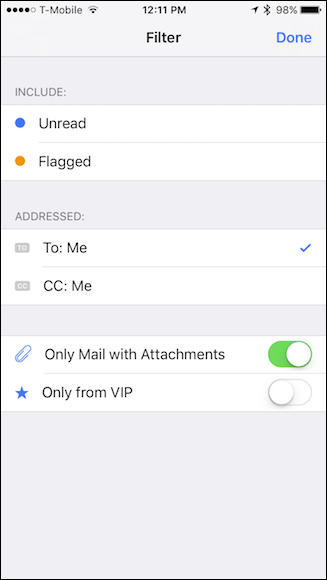 To use filters, open Mail on your iPhone or iPad and tap the new filters button in the lower-left corner. Tap that little filter button and you’ll see the bottom of the Mail window shows your current filter scheme. In this case we’ve already filtered our mail according to mail sent to the addressee (Me) and any messages that have attachments. Tap on that “Filtered by” link to open the Filter panel. Your options are limited to what you see here. 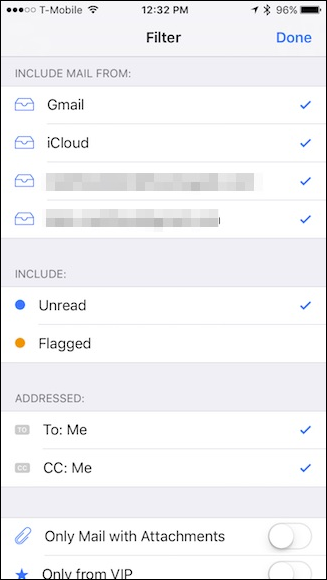 When you’ve finished choosing how you want to filter your mail, tap the “Done” button in the upper-right corner, and you will be returned to your current inbox or mailbox folder. 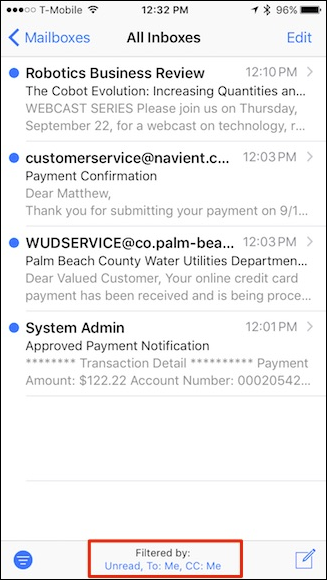 Your mail will be filtered until you tap the FIlter button again to turn it off. Here’s a view of Mail’s filters when we view them from “All Inboxes”. 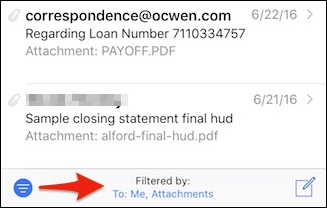 Unlike when you set your filters from one particular mailbox (assuming you have more than one), the all inboxes view lets you include mail from any one or more (or all) of your mailboxes. Here, we’ve filtered all mailboxes to Unread mail sent to Me and CC’d to Me. Using filters will at least let you sort through the daily deluge you’ve likely become accustomed to. Filters are persistent, meaning they’ll remain as you configured them for each mailbox. For example, if you assign a filter scheme to one account, a different scheme to another, then each scheme will be retained particular to that account for the next time you apply the filters. We’re looking forward to see whether Apple expands these new filters, at least adding criteria, and maybe even the ability to set up custom filter rules. Still, this new feature should give everyone valuable tools to find important e-mail that might have gotten lost among the spam and other nuisance messages.